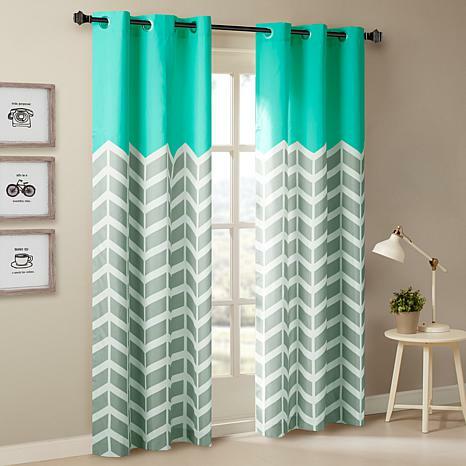 Intelligent Design Alex Chevron Grommet Curtain Pair-Aqua-42"x84"
Intelligent Design Alex Chevron Grommet-Top Panel Curtain Pair - Aqua - 42" x 84"
Our Intelligent Design Alex Chevron Printed Panel Pair adds bright color and fun style to your room. 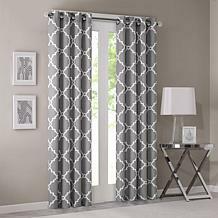 These window panels feature a grey and white chevron print and a bold aqua top border, for a refreshingly modern update that pops! 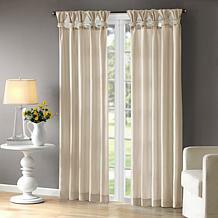 Each window curtain is made from a polyester microfiber for easy care, while the foam back finish creates a room darkening effect for energy efficiency. 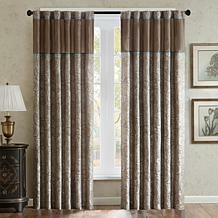 Finished with silver grommet tops making it easier to hang, open, and close panels throughout the day. Fits up to a 1.25" diameter rod. 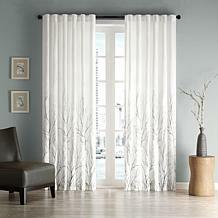 Madison Park Saratoga Fretwork Valance - Grey - 50"x18"